The First Lady of USA has been in news for being much more than the wife and inspiration of the President himself. Michelle Obama has also contributed much to the world of elegant and thoroughly chic fashion which has inspired people of different generations at stretch. It is however, not just about what she wears. It is just as much about how she has managed to maintain a silhouette at the age of 50 that can give any actress bordering 30s a run for their money. Early to bed and early to rise is a piece of wisdom that is understood best by the First Lady. She wakes up even before the lark does at about 4:30 to 5:00 in the morning and hits the gym. Once she is in the gym, she engages in a healthy dose of flexibility exercises and cardio. She has faith on the outcomes on yoga and pilates and she expresses that it works wonders in favor of developing flexibility. Jumping rope and kick boxing also form a part of her schedule and she believes that it offers a whole body workout with exceptional toning and fitness enhancement benefits. 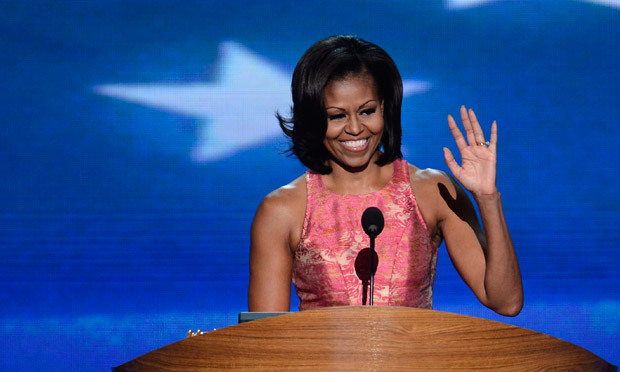 If you are wondering if Michelle Obama has been blessed by angels for arms that toned, think again. The First Lady of USA pumps iron and this is the reason behind keeping the flab away even at 50. She believes that women must clear any misconceptions about lifting weights and the impact that it has on the feminine musculature and get on with the practice. Besides this, she is an active person by nature and is always in a participating spirit when it comes to sports like tennis etc. Michelle Obama’s diet plan can be wrapped up in two words… ‘simple’ and ‘healthy’. She is not one of those number conscious people who go by what the measuring tape has revealed and what the weighing scale has pronounced. In fact, she does not even count her calories. All that she believes in having in her plate is food that contains basic nutrition in the right content. Her requirements are distributed in 5 balanced meals a day including lean proteins in the form of fish; a carbohydrate in the form of brown rice, potatoes etc and a lot of vegetables. At the same time, she loves snacking of healthy foods like fresh fruits. So, basically, the secret to the vibrant spirit and enviable frame of Mrs. Obama lies her clear perception of her dietary and workout requirements than following some odd fad narrative to attain something rather unattainable. This is a lesson for the ladies who are out and about following fad diets and workouts to resemble ramp models and compromising their health in turn.